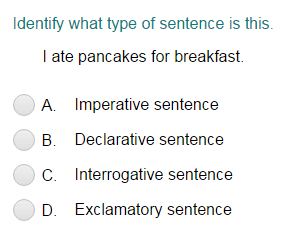 What did you think of Identifying a Sentence as Declarative, Imperative, Interrogative, or Exclamatory Part 1 ? An interrogative sentence asks a question. It always ends in a question mark (?). An imperative sentence makes a command or a polite request. It ends in an exclamation point (!) or a period (.). If the command is forceful, use an exclamation point. If the command is polite or is a request, use a period. An exclamatory sentence shows surprise or strong feeling. It always ends in an exclamation point (! ).